As an archaeologist, one of my aims is to take a materially grounded interpretation of the past and work through the multiple trajectories of our development to shed light on the present. It is cliché to quote George Orwell as an archaeologist, but one need not look very hard to see the ways those in power manipulate the past to rule the present and shape the future. This is perhaps why “Feasts for the Future” resonates with me. I can see the utility in reshaping the relationships around food and eating together to create community, because the archaeological record shows how those very relationships were manipulated to create a system of inequality and exploitation that culminated in our own hyper-capitalist order. The consumption of food and drink is a biological necessity and a highly symbolic action. We are social beings and whom we eat and drink with helps to develop our social identities. Dinner with the family at the dining room table, beers after your shift with your co-workers, or conversation over dinner with a date, all work to strengthen social bonds and help us find our place within society. At the same time, what we eat can tell people about our values, religious beliefs, social status or ethnicity. Additionally, the setting of food consumption can greatly affect its significance. Consuming crackers and wine at a gathering at a friend’s house has different social meanings than doing so during communion at church. Feasts are a special location for the creation and negotiation of these social, economic, political and religious identities in society. Through their elaborate settings, sumptuous offerings, and overtly symbolic messaging they help to define our relationships to each other. However, we recognize these markers only in relationship to the day-to-day meals that comprise our daily subsistence. That is, the Christmas leg of lamb becomes special not because of the cut of meat itself, but because of the recognized social meaning of the gathering and its participants. Feasts can be empowering and unifying; gatherings that bring communities together toward a common goal. An Amish barn raising or a community potluck are examples of feasts that create unity and cohesion. Feasts can also be exploitative and aggrandizing: that is, that they work to mask, create or maintain social divisions in society. Roman public festivals where the elites gave bread and wine to the people operate on the same principle as your work Christmas party. The reasoning goes that if we can distract them with token amounts of food and drink then they will not notice the inequity of society (unless the company opts for a cash bar or a cold cut platter). Archaeologically, much of the emphasis on food and feasting has focused on exploitative feasts to explain how groups of people rise to power and how they maintain that power. 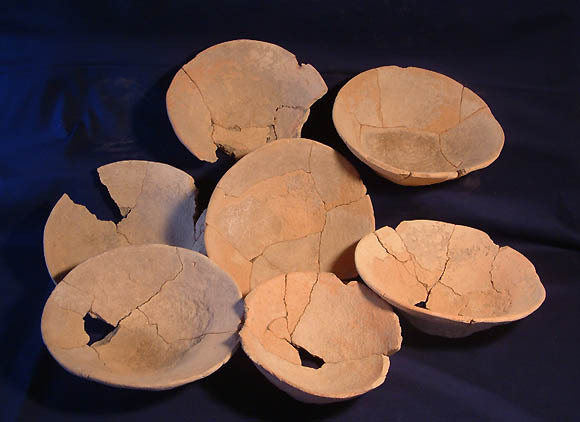 The first archaeological identifiable feast in the ancient Near East dates to about 12,000 years ago and was an elaborate funeral feast at the site of Hilazon Tachtitin northern Israel. Brian Hayden has argued that feasting provided the impetus for domestication as local leaders sought to distinguish themselves by lavishing guests with symbolic foods, the most important of which might be beer. The tentative identification of beer made from wild grains in large limestone basins at the Neolithic site of Göbekli Tepe in southeastern Turkey could help support this hypothesis. At Göbekli Tepe, around 9100 BCE, the ancient occupants of the site erected hundreds of limestone pillars, weighing up to 16 tons and carved with images of humans and animals. The role of feasting at Göbekli Tepe is still being explored, but the monumental enclosures could have hosted large gatherings, dances and feasts. Based on the recovery of large quantities of wild animal bones in the soils used to intentionally bury the enclosures, the community likely held a large feast(s) to bring people together for the massive labor project associated with filling these structures, which could also help explain how people were motivated into initially erecting the megaliths. For much of the next five millennia, feasts occurred in remarkably similar contexts across most of the ancient Near East. People organized feasts to create alliances, mark special occasions, build communal structures, harvest crops or to mark important transitions in life, such as birth, death or marriage. This does not mean that people did not organize feasts in order to acquire power or manipulate their neighbors, but if they did so, they were unsuccessful in maintaining those advantages across multiple generations. By around 4000 BCE, the orientation, location and impetus for feasting begins to shift. The emergence of the first state societies in Uruk Mesopotamia illustrates this clearly. At the site of Uruk, we see the construction of a central monumental sector,the emergence of bureaucratic institutions, writing, and artistic representations of priests or kingship,violence and social differentiation. 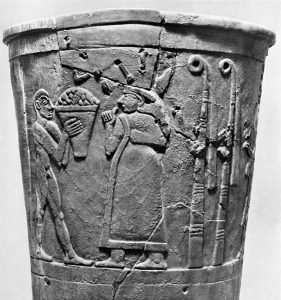 Evidence for elite feasting in Uruk society can be found on the carved limestone vessel found in Temple of Inanna called the Warka Vase.This vessel depicts the order of society with lower class individuals bringing agricultural goods to the elite, who then present it to the main deity of the city, the fertility goddess Inanna. The state controlled agricultural production and the earliest texts tell of the receipts and allowances of the centralized economy of the Uruk state. The central collection of grain, meat, wool and other agricultural products by the state produced a large lower class of people dependent on the state for their subsistence. In short, the communal granary and public spaces that built social cohesion in early agricultural societies gives way to private state storehouses and bureaucratic institutions that controlled what and how much a large portion of the population consumed. Brain Hayden, Neil Canuel and Jennifer Shanse (2013) – What was Brewing in the Natufian? An Archaeological Assessment of Brewing Technology in the Epipaleolithic. Journal of Archaeological Method and Theory20:102-50. Although numerous scholars have argued for other functions including bread molds, salt production vessels, and tax collection tools. 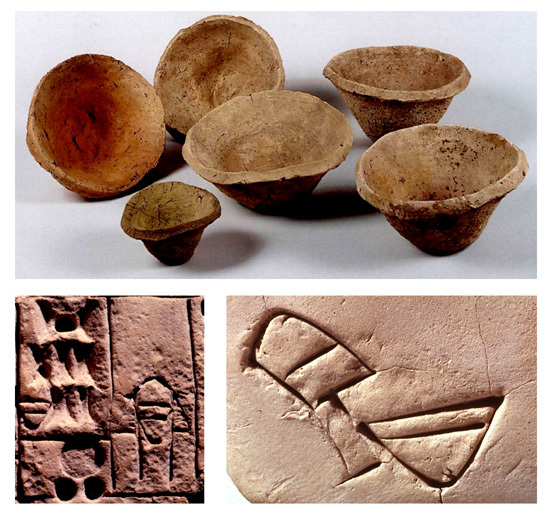 Susan Pollock (2012) – Politics of Food in Early Mesopotamian Centralized Societies. Origini 34:153-168. Reinhard Bernbeck (2009) – Class Conflict in Ancient Mesopotamia. Anthropology of the Middle East 4:33-64. Jason R. Kennedy is a fixed term faculty member in the department of Sociology, Anthropology and Social Work at Central Michigan University and a doctoral candidate of Anthropology at Binghamton University, New York. His dissertation is focused on the analysis of ceramic use alteration to address changes in the social organization of labor and commensality during the Terminal Ubaid Period of northern Mesopotamia. He has worked as a trench supervisor and ceramic analyst for the site of Kenan Tepe in Diyarbakir Province, southeastern Turkey from 2007-2013 and is currently a member of the Nasca Headwaters Archaeological Project investigating imperial dynamics in the Wari and Inca empires of Peru.